The project, covering an area of over 15 hectares on the land housing Phu My Fertiliser Plant at Phu My 1 Industrial Zone in southern Ba Ria-Vung Tau province, consists of two parts: revamping the NH3 Unit and build Phu My NPK Plant. The complex project has a total investment capital of nearly VND5 trillion, some US$37 million, 70% of which will be financed by bank loans and another 30% by the owner's equity. After completion, the upgrading of the NH3 Unit will increase the current ammonia output at Phu My Fertilizer Plant by 90,000 tonnes per year, from the current 450,000 tonnes per year to 540,000 tonnes. Plans call for adopting Denmark's Haldor Topsoe A/S technology. 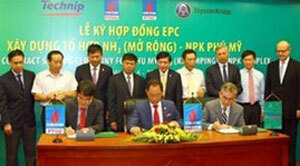 The EPC (Engineering, Procurement, Construction and Commissioning) contractors include Italy's Technip Group, previously the contractor for Phu My Fertiliser Plant, and PetroVietnam Technical Services Corporation (PTSC). The products from the plant will be used as direct feedstock for Phu My NPK Plant, as well as to supply the domestic market, which still suffers from a shortage of NH3. Meanwhile, the projected Phu My NPK Plant, with a manufacturing capacity of 250,000 tonnes per year, will put in place Spain's Incro SA chemical technology, the most advanced technology in the world, to manufacture high-quality NPK fertiliser, which will guarantee all necessary nutrients for crops at different growth periods and under different soil conditions. The contractor consortium for the complex is Germany's ThyssenKrupp Industrial Solutions and PetroVietnam Technical Services Corporation. According to the Ministry of Industry and Trade, demand for NPK fertiliser increased from 2.1 million tonnes in 2005 to some 4 million tonnes in 2014, with an annual average growth of 7%. Yet, domestic production can currently only meet 5% to 10% of high quality NPK. "Total capital investment of the complex project is not large, in comparison with other oil and gas projects, but it has great importance to the national economy that helps ensure the country's agricultural sector," PetroVietnam's chairman, Nguyen Xuan Son, said during the signing ceremony. Son noted that Vietnam was still importing around 300,000 tonnes of high-quality NPK fertiliser per year, and the output from Phu My NPK Plant were expected to replace most of the currently imported NPK fertiliser. The complex will be brought into operation during the second quarter of 2017./.